So this is a pretty embarrassing story. I was definitely having a minor girly freak-out session the other day in the kitchen. No, I didn’t cut my finger off. No, there was no grease fire. Rather, it had to do with a chicken, a head, and my monstrosity of a cleaver knife. Let’s back this story up just a little. What resulted in my cutting the head off a chicken in the first place? It all started with the last visit from my parents when my mom brought me these little Chinese herbal packages she put together for me to make chicken herbal soups. So when I went shopping around Chinatown this week, I spotted black chicken in the packaged meat section of the grocery mart. Headless and feetless. Score! …Or so I thought. Behold my horror when I unwrapped the chicken from its package and found that the head was deceivingly tucked out of view. Oh. My. God. Okay, okay. No need to panic. I’ve got a cleaver. I’m an independent woman. I can do this! Oh, did I mention that birds make me slightly jumpy? (I blame this on Hitchcock). I like to call this the “supermarket syndrome,” in which we North Americans so programmed to seeing our food nicely packaged up and so displaced from its original state that we’re often shocked to find it in it’s most natural state. Keeping the heads and the feet on chickens was and continues to be a common practice. A big part has to do with offering a whole chicken during 拜神 ceremonies (pronounced “bai sun” in English and translates to "worshipping the [Chinese] gods"). Perhaps I wouldn’t have blinked an eye at the thought had I grown up immerse in the Chinese culture. But being born and raised in Canada, I grew up with supermarket chicken, all nicely wrapped up in plastic with its own little foam tray. So imagine how I felt having to actually cut the head off a chicken carcass. It’s a task that even my mother, a fabulous cook in her own rights and had probably witnessed many whole chickens (and perhaps even live slaughters) in her childhood, always relinquishes to my father. It was actually quite an absurd scene—cleaver in one hand, tongs in the other, holding the chicken in place on the cutting board. My eyes squinted closed as I blindly hacked away at what I hoped was the base of the neck. And to further increase my horror, just when I thought I had cut off the neck and was lifting the carcass to separate the two, there it was, still half dangling and swinging back and forth. My eyes widened and shock and I immediately dropped chicken and tongs back on the board and took a few steps back, all while a really girly yelp escaped from my mouth. I know. What a pathetic scene, right? Needless to say, I managed to finally get the head off and out of my sight forever and I could proceed with the rest of the soup. 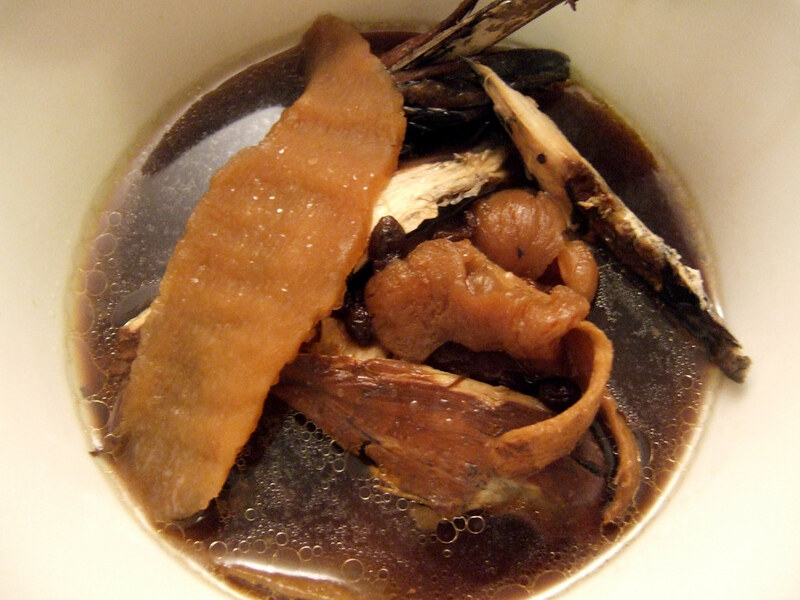 Chinese chicken herbal soups are meant to be nourishing for the body. Hopefully it’ll also nourish my mental health after this traumatizing experience! Needless to say, that will probably be the last time I’m ever cutting the head off a chicken. And FYI, this soup can also be made with a regular white chicken. 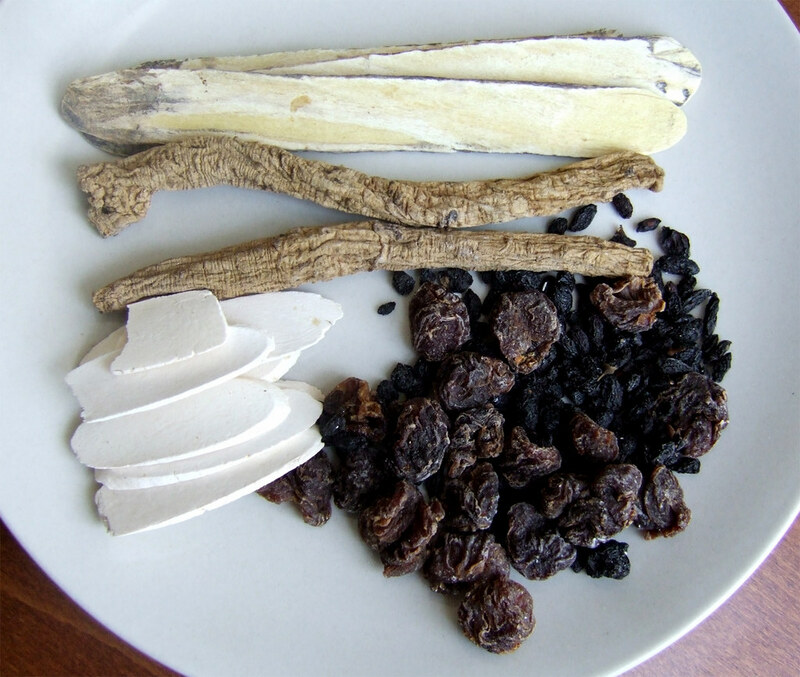 The Chinese herbs listed below are pictured above, in descending order and from left to right. 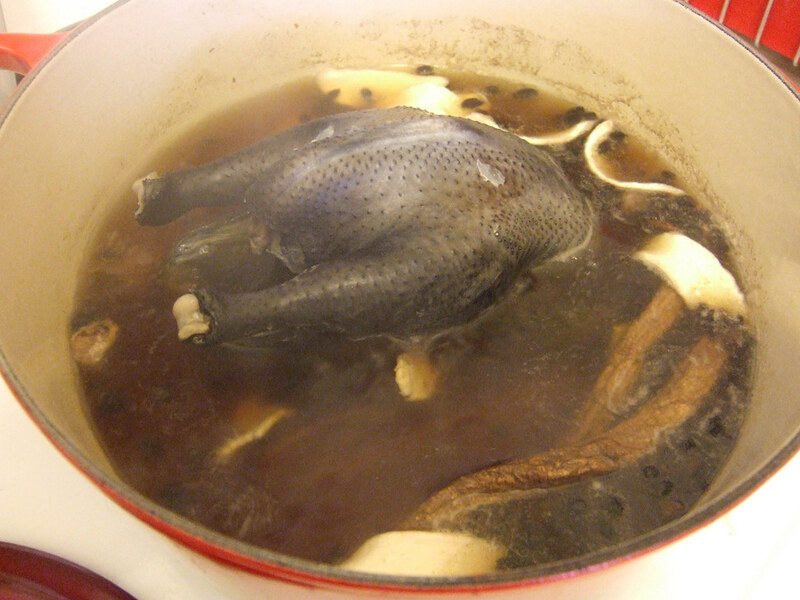 Blanch chicken in boiling water for 8 to 10 minutes to remove any impurities and excess blood. Drain and rinse. Place the chicken in a large heavy stock pot along with the rest of the ingredients. Bring to a boil, then cover and simmer on low heat for at least 2 hours. If the water is evaporating too quickly, just top it off with some boiling water and reduce the heat a little more. When the soup is ready, the soup should be really fragrant and dark in colour, and the chicken should be falling off the bone. Season with salt to your taste, and serve hot. **N.B. 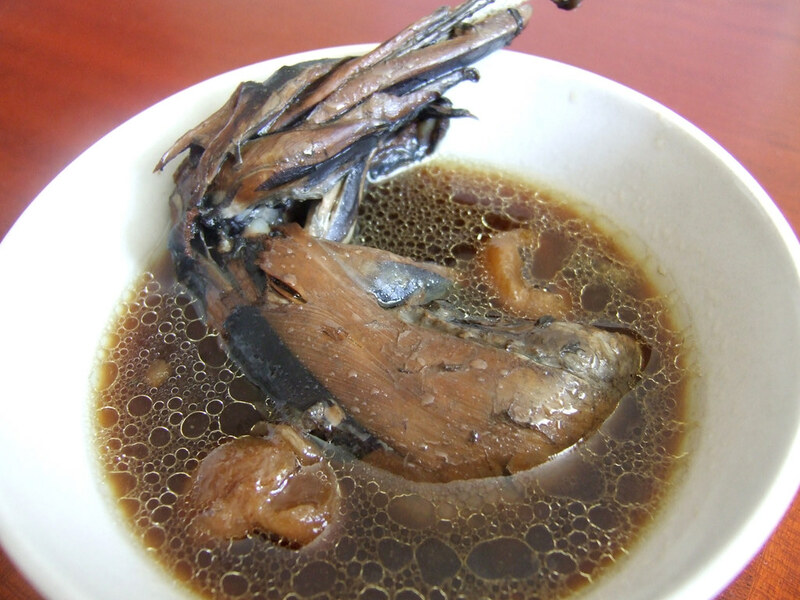 If you don't remove the skin, you might want to skim off the layer of fat before serving the soup. Posted by Bonita at 7:55 p.m.
Sylvia March 14, 2010 at 2:30 p.m. 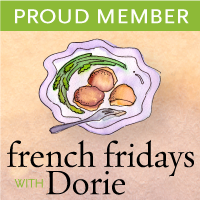 I think you're really brave (in chopping that head off) and I'm passing along a blogging award to you! Anonymous March 26, 2011 at 2:57 p.m.
Ok, this is going to sound like a weird question, but are chickens with the heads and feet still attached common in Chinese markets? For reasons too complicated to explain (but a lot less creepy than it sounds) I want to mummify a chicken, and having one with a head would be better.